We begin with Helavisa, the most egregious of the week's offenders. Despite having no weaponry, her Drake managed to be incredibly offensive. She was ganked by Agents Astrid Tyrfing, Votre Dieu, Narl' Amhar, and Rungerd. One can only imagine that Helavisa was trying to use her Drake as a hauler, to avoid the fate that she knew would befall a freighter (or even a Deep Space Transport ship). "How did you know I was a bot-aspirant?" she might ask. 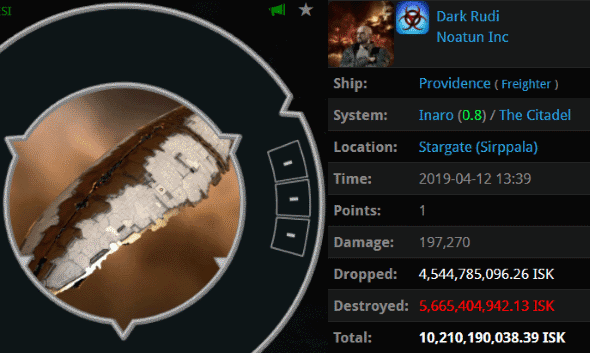 The New Order Outreach Division has been causing much consternation among the idle supercarrier pilots of nullsec. 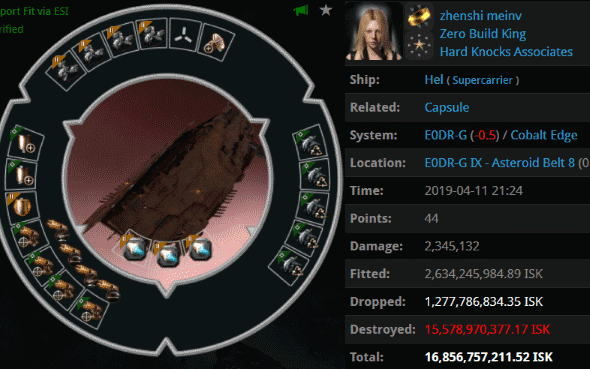 zhenshi meinv was given a gentle reminder of the Code and the plight of highsec by Agents cuffdawg, atrophocy, Adrian ostus, Velsharoon, and TigR Kashada. Reminders are important. Schildy knew that Uedama and the surrounding systems are always being policed for unlicensed freighters and jump freighters. Maybe Schildy wasn't sure if Bowheads get the same treatment. They do. Agents PogChampion, Daniel Chanline, patyooki, brainlet, James BIG BONED, erobb, oink piggu, somnolence, Shy Elf Trap, Serious Web Developer, tumblr ptsd, Johnie Stark, Aiko Danuja, Alleil Pollard, and Lupus Caedora gave Schildy a 14.2 billion isk lesson about the Code's view of unauthorized Bowheading in New Order territory. Incidentally, carebears, you can add CODE Administration to the list of corporations that have plenty of Taloses to throw at you when you misbehave. Dark Rudi, too, was blasted by a corporation with a lot of firepower. Agents Olivia Rackner, Zoe Rackner, Charlotte Rackner, Jemma Rackner, Celestia Rackner, Ashlee Rackner, Kirra Rackner, Yan Rackner, Emily Rackner, Jani Rackner, Georgia Rackner, Benji Rackner, eviserater Adoudel, Phoenix Rackner, Lazergunz Pewpew, Ivy Rackner, King Tonto IV, King Tonto III, Rebecca Rackner, Kimberly Rackner, Adara Gaea, Globby Rackner, hegils, King Tonto II, King Tonto V and King Tonto I flew the flag of the Advanced Tear Harvesting V corporation. I wonder how long it took Dark Rudi to come up with the fit for his ship? On the surface, Eddy33 might look like just another Skiff pilot who enjoys his bling. But as we'll see, there's something even more sinister going on with Skiffs these days. 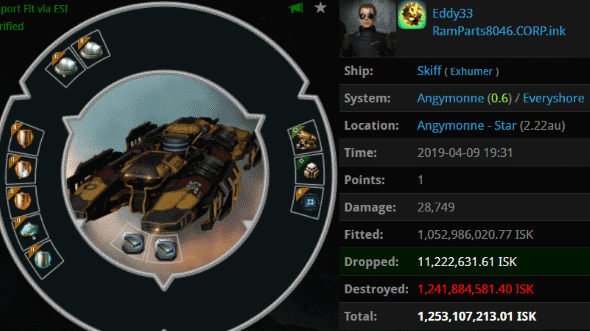 Agents Misha Mawashi, Dishrag, Overmind Niminen, Maximus Gooseman, Edmund Sublett, Lewak, Salah ad-Din al-Jawahiri, Eduard Limonov, and Elena Sabezan ganked Eddy33's Skiff as part of an ongoing investigation into the mining bots that plague highsec. Pictured here is merely a sampling of the mysterious clouds of Skiffs that have been spotted lately. Unlike Eddy33, many of these Skiffs are piloted by members of NPC corps who use a particular naming style. 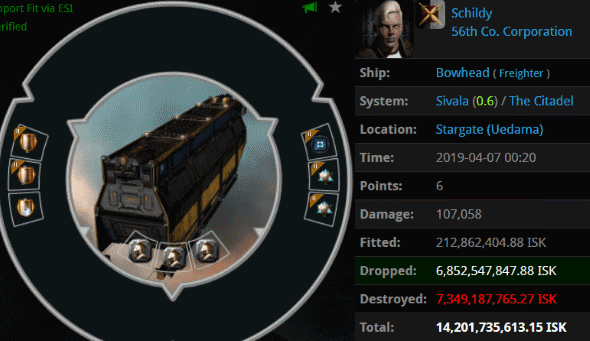 Agents in Dreamweb Industries have been hunting and killing these Skiffs, most of which are worth about a billion isk each. They do not flee the area when their fellow Skiffs are ganked. That's suspicious, to say the least. Even other bots would report these guys for botting. 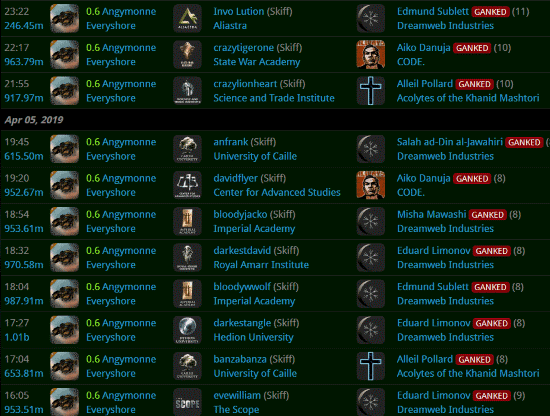 Of course, some miners aren't botting--but they're still in desperate need of a good gank. 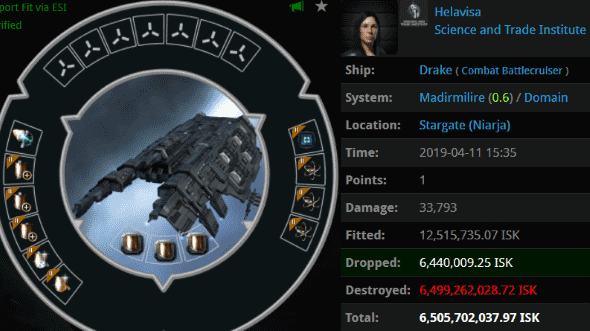 Look at Devon Jordessen's 3.2 billion isk Hulk. 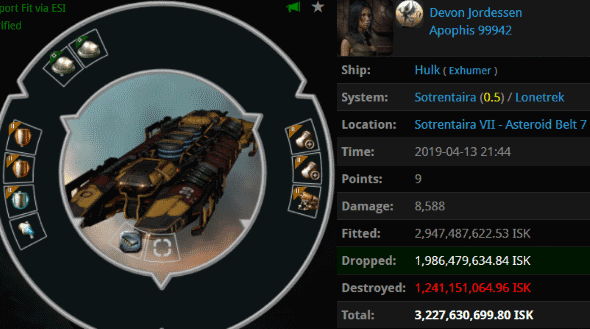 It's rare to see a Hulk that expensive, especially if it's not carrying Skill Injectors or PLEX in the cargo. Agents Lewak, Gagah Enforcer, and Yamadutas saw this miner and gave her the ol' antimatter handshake. Miners, don't use these drones unless you intend to be harvested yourself. Wow! Good Fight in Angymonne! angelafighter's fleet has been botting for years and years in the Everyshore ice belts. She used Macks until she met me. And yes, even the bot-aspirant locals can't stand her. Look who flies with the homosexual cockmaster.